We were on the right path as despite the market euphoria there was one stock, which lagged behind the others and the gap was significant. The laggard Advanced Micro Devices (AMD). It was the only one, which showed the negative price dynamics for the first ten months of 2017 with a -2.71% loss compared to +104.58% for NVDA, +43.94% for TSM and +14.62% for S&P 500. So, the success of the bet wasn’t apparent, and I made a separate chart analysis for AMD to find out if this stock weakness was the part of the strong downtrend, which could be a bad sign, or if it was just a retracement within an uptrend, which is a good sign. 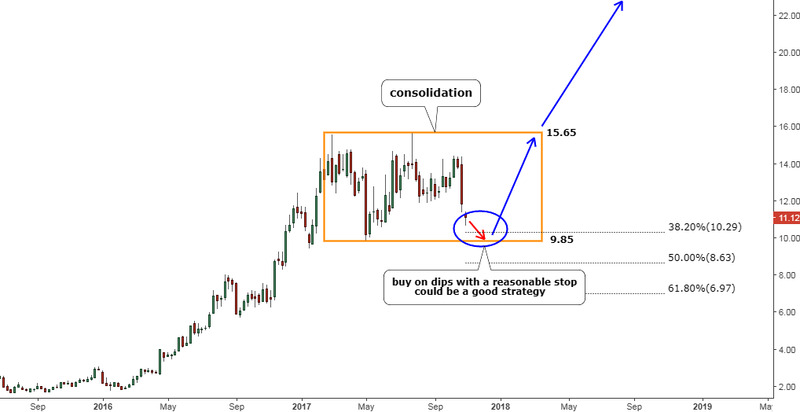 It was good luck to spot the market misbehavior at the right time as the structure of the price development charted the consolidation pattern after a strong rally occurred in 2016. As I mentioned above, it was a good signal as the stock was expected to resume its rally after correction, besides we were witnessing the final stage of it. The idea was to buy the stock on the dip to the $9 level in the area of the earlier low ($9.85), and 50% Fibonacci retracement level ($8.63) as consolidation had a flat shape. The price was traded at the $11 level when the analysis was posted, and we should sit and wait for the chance to come. Patience paid well as the price dipped right into the $9 area this spring to grant us the desired entry level. Here is the link of that chart of AMD in November 2017 for you to see the initial trading setup. The target was calculated as the equal distance of the earlier rally of $14, which was added to the entry level of $9 as it was expected to be repeated to hit the ambitious target at the $23 level ($9+$14). It was not emotionally driven simple math. Bingo! Last week the AMD hit the $24 handle to gain more than 160% in 5 months. Congratulations! But what about the other two stocks from that post? Maybe they did even better as they scored tremendous gains last year and they had much better fundamentals. The AMD that time gathered the minority of votes of only 20% compared to 52% for TSM and 28% for NVDA. Let’s see the answer in the chart below. I added to the comparison the main Buzz Maker of the last year, the Bitcoin, the symbol of the crypto-world where the modern “gold rush” emerged. It was put on the left scale not to outshine the stocks by its brief Santa Claus rally to see all the zigzags charted for the period. As you can see in the chart above, the AMD stock not only hit the target but also beats both rivals and the S&P 500 index by a large margin and surpassed the Bitcoin at the end of the period. Neither the past price dynamics nor the fundamentally weak position could predict such a strong rally of the AMD those days. But the combination of pendulum effect (leaders-laggard) and clear chart structure (consolidation) could do it. The AMD stock price grew in spite of the fading glory of the crypto-market mainly due to its reinvigoration in the CPU market amid the possible delay in delivering new 10-nanometer chip technology by its ultimate rival Intel Corp. (INTC). why is the stock $3.00 in Asia and $5.40 in the USA? It looks like GDR on LSE is equal to 2 shares on Taiwan exchange if I got it right. What is tour opinion on FOX CONN stock HNHAF ? did it ever split ? is it going to split ? I can't tell you about splits as I don't follow this name. I couldn't find the ticker you have mentioned (HNHAF), although it is a well known company Hon Hai Precision Industry (Foxconn). I prepared a chart for you based on its ticker HHPD (GDR on the London Stock Exchange) at this link https://www.tradingview.com/x/aVtKdlVG/. We should watch the reaction of the downside of an uptrend as stock price is approaching it. Reversal or breakdown there would give you a clue for further price action. I hope this will help you.